Ventana Research today announced the 30 winners of the 2016 Technology Innovation Awards. These Awards, presented annually, identify the technologies that have had or have the potential to have the most striking positive impact and honor their providers. The Technology Innovation Awards are the most prestigious annual industry technology awards backed by a proven industry analyst firm with market research and expertise across business and IT. The awards thus recognize pioneering vendors that contribute advancements in technology that drive change and increased value for organizations worldwide. 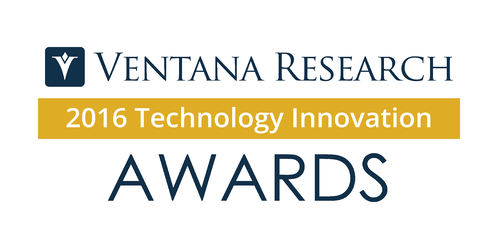 Ventana Research invited all technology providers to nominate their technology innovations to be considered for the awards. Recipients were selected based upon the vendor's contributions in the specific business and/or IT category and the extent to which they will help organizations innovate or enhance the productivity and outcomes of business or IT processes. Ventana Research highlights and acknowledges the importance of these innovations through the annual Technology Innovation Awards. To learn more about the Ventana Research Technology Innovation Awards and to see what previous award recipients have said about them please visit: www.ventanaresearch.com/Awards. Media: Interviews on the Technology Innovation Award Winners are available upon request.